Interlocutor: Well Master. 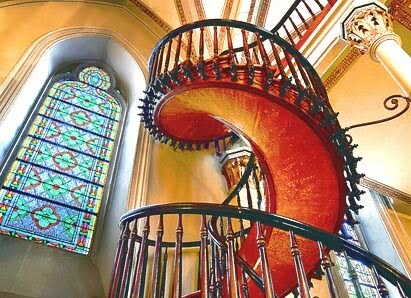 I have some question about the well-known staircase at the Loretto Chapel. Are there aliens involved on this mysterious staircase or not? Ruanel: No, no. Let’s say that everything has been misinterpreted. Speaking about carpentry or in terms of engineering, it’s possible to build a spiral staircase without a base. That it was built in one day as many legends say, it’s not true. This was also distorted as well. That the carpenter who built the staircase left without asking for payment, it’s somehow true. In fact he didn’t leave without receiving money, but he had lodging, he had taken food and he collected some money. Once he concluded his work, since he was a very religious person, he directly abandoned the place. Some people said that he was a Joseph himself incarnated, and we know that that’s impossible because once a person had a role; he or she can’t have the same role again. They said mistakenly that the carpenter was Joseph, the adoptive father of Jesus. Ruanel: A very skillful carpenter! However it’s not true that he finished his job in one day. That is not true. On the other hand, it’s possible to build a staircase without a base, having just a central support, a spiral staircase. This you can ask to any experienced carpenter. Interlocutor: But not many people can make that work. Interlocutor: Well. I have another question regarding The Bilderberg Club. Is it really a wicked organization as some people say? Ruanel: It's really an organization that handles a lot of money, an organization that has a lot of power. Powerful enough to handle even the politics of many countries. Wicked? I would say that it depends on the point of view that we look at it. Interlocutor: Were there murders in this organization or nothing like that? Ruanel: Look, there were assassinations in between. But many of the members of this organization are idealistic people. I mean, if you or this vessel could channel a thetan of one of the members. The thetan would talk to you wonderful things about this organization. Interlocutor: Well, people also say wonderful things about Bin Laden and George Bush, he he! Ruanel: One more question because the vessel is already very tired. Interlocutor: Let's see how about the Comet Elenin? Ruanel: Elenin is a comet that passes by the Earth at many millions miles away and it does not cause anything, no cataclysm on Sun 3. That some people say that behind or in front of the comet there were alien spaceships is just nonsense, it has no coherence or common sense because the space ships would be detected by telescopes at once. Why would they expose themselves? The telescopes would aim at the comet. Why would the spaceships appear in front of the telescopes? It is a matter of using common sense and there's no common sense on this story. And for the moment we would end here. Interlocutor: Okay Master Thank you very much for your answers. This entry was posted at Thursday, December 22, 2011 and is filed under Mysteries and Enigmas . You can follow any responses to this entry through the .